play time pilot | JAMSX Retro MSX1 / MSX2 Computer Games in Your Web Browser. 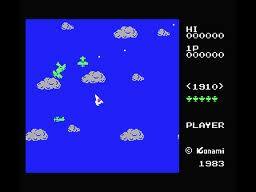 Time Pilot (夕イム・パイ口ツ卜) is a multi-directional scrolling shooter and free-roaming aerial combat arcade game designed by Yoshiki Okamoto, released by Konami in 1982, and distributed in the United States by Centuri. Debuting in the golden age of video arcade games, it is a time travel themed game that allowed the player's plane to freely move across open air space that can scroll indefinitely in all directions. The Killer List of Videogames included Time Pilot in its list of top 100 arcade games of all time. A sequel, Time Pilot '84, was released in 1984. It has a top down view instead of a side view, allows the player to shoot guided missiles, and takes place over a science fiction-themed landscape.